Concordion execute command can be used to run the operation of concordion fixture in a repeating manner. For example, it will be useful if we want to illustrate a requirement with multiple examples in the form of a list. 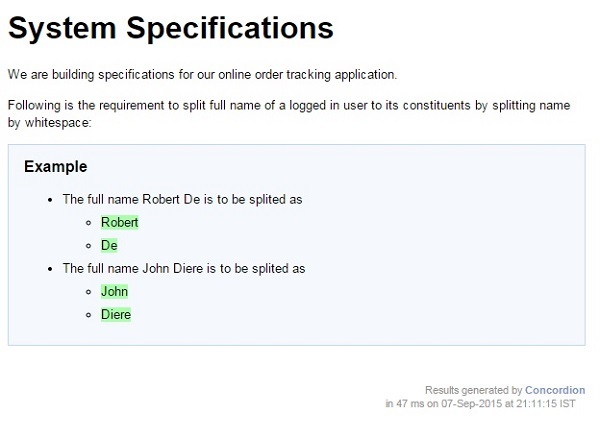 When Concordion parses the document, it will set the value of the special variable #TEXT to be the value of the current element as "Robert De" and pass it to the split function. Then it will execute the split() method with parameters as #TEXT using execute command and set the result into #result variable and using result, print the firstName and lastName values as the output. 1 Create a project with a name concordion and create a package com.tutorialspoint under the src folder in the created project. 2 Add required Concordion libraries using Add External JARs option as explained in the Concordion - First Application chapter. 3 Create Java class System under the com.tutorialspoint package. 4 Create Fixture class SystemFixture under the specs.tutorialspoint package. 5 Create Specification html System.html under the specs.tutorialspointpackage. 6 The final step is to create the content of all the Java files and specification file and run the application as explained below. System.html is the output of Concordion test run.